In the month of March 2013, one of the most talked about news events in the Miami community circles was the powerball lottery of $1 million won by the employees of a company called Keller Williams Partner Realty. Around 12 employees of the company had pitched in $20 each to buy Powerball tickets. When they found that one of their tickets had won $1 million, they were absolutely thrilled. That day, when they came to the office all of them were in a happier mood as they had won $83,300 each. But there is a much more interesting aspect to the story. When they were planning to buy the tickets, they also wanted one of the new employees in their office, Jennifer Maldonado, to be a part of the pool. But she couldn't spare the $20 as she was yet to get her first pay check with the company. So when the group informed her that they had won the lottery, and they wanted to share the money with Jennifer anyway, she was understandably stunned! She was really happy that her colleagues wanted her to be a part of that lucky group. In addition to Florida, this game is also played in 41 other states and the District of Columbia. 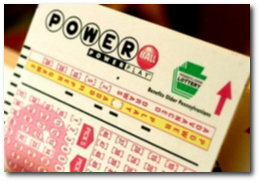 Powerball game is a lottery game with a starting jackpot price of $40 million. To play you choose from two sets of numbers. From the first set, you have to select five lucky numbers from a group of numbers ranging from 1 to 59. In the second set, you choose one number, called the Powerball, from a set of numbers ranging from 1 to 35. The draws for this game are usually held at 11 p.m. EST every Wednesday and Saturday in Orlando. And a proper mechanical draw machine and balls are used, instead of those computer based draws which many people don't trust. So 5 white balls are drawn out of a drum containing 59 balls, then 1 red ball is drawn out from another drum containing 35 balls. Playing Florida's Powerball is extremely simple. Players have to make use of a play slip to select the numbers. The play slip contains two sections of numbers. In the upper section of the play slip you mark 5 boxes to select from the numbers 1 through 59. Then in the lower section you mark 1 box to select your Powerball from 1 through 35. This combination of 5 main numbers plus a Powerball is one entry which costs $2. You can also use the quick play option which lets the computer pick random numbers for you. If you want a better chance of winning, you can simply play more entries. But of course this costs $2 extra for each one. Which can get expensive quite quickly. Buying 50 tickets gives you 50 times the chance of winning, but does cost $100! Which is why Florida lottery pools are so popular - everybody shares the cost of entering. And the prize money too - but a jackpot of $200 Million shared between 50 people is still $4 Million each (before taxes)! What About The Power Play Option? Players also have the option of adding Power Play to their tickets. This increases the prize money for prizes at the lower level if you win. The jackpot prize remains the same though. For Example, if you match 4 out of 5 numbers and the one power ball number correct, you would win $10,000. With the Power Play option, the prize money is increased to $40,000. But Power Play does cost an extra $1 per entry, making each play $3 instead of $2. If the prize money is less than $600, you can claim directly from the retailer where you bought your tickets. For larger prizes you need to complete a claim form for the lottery company. If you are lucky enough to hit the jackpot, you then gave the tricky option of choosing to take the payment in one lump sum or in the form of annuity. The lump sum will of course be a lot less, but you get it all at once. There will also be Federal Government and State taxes to be deducted. It's wise to get advice from professional advisors who have experience of handling big lottery wins before making your claim.